Here at Clever Paws we believe training dogs should be a fun and enjoyable experience for you and your dog. We provide dog training classes for puppies and adults whatever the breed, from beginners to advanced. Our courses are informative to help give people a well rounded understanding of how a dog thinks, with a range of activities to enhance their mental and physical well-being. Clever Paws only use kind, fair, effective reward based training techniques, based on the modern understanding of how a dog learns. We do not allow choke chains in class and will offer owners alternatives for a kinder way to teach their dog. Classes are held in Chilwell (see location page for maps). Our training classes are held indoors, although we do go outside to work on some areas of dog training. Class sizes are kept small so that we can work closely with everyone but big enough to socialise your puppy/dog, maximum 10 dogs per class. 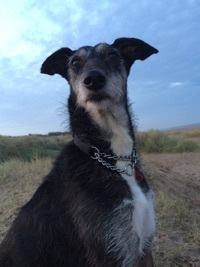 This is Sprocket my Lurcher, I rescued Sprocket from Hathern Dog Rescue in February 2008. He has passed his Good Citizen Bronze, Silver & Gold in 2009. He was also part of an advanced demonstration team. 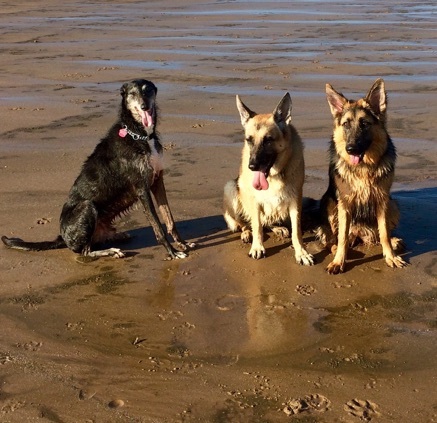 He has since retired and enjoys nothing more than playing on the beach with his best friends Maddie & Pepsi (GSD) who belong to our fellow Clever Paws Trainer Lisa!